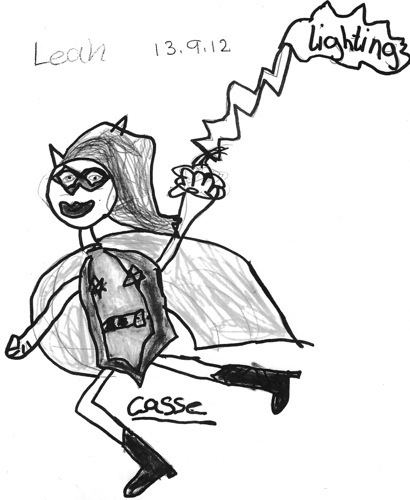 2012 has been a record-breaking year for kids’ workshops at the Scottish Cartoon Art Studio. 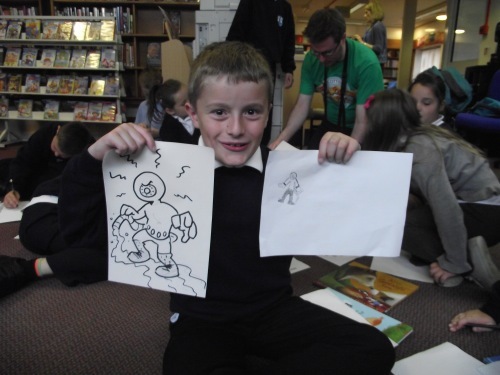 Two of particular note were our contributions to the Every Picture Tells a Story project, run by North Ayrshire Libraries Children’s Literacies & Arts Service and Stirling Libraries’ Off the Page festival. For Every Picture Tells a Story, P6 pupils at Ardeer Primary in Stevenston were visited by storyteller and musician Gerry Durkin. Among the many songs and tall-tales that Gerry told there was one story concerning Vikings that really captured their imagination. 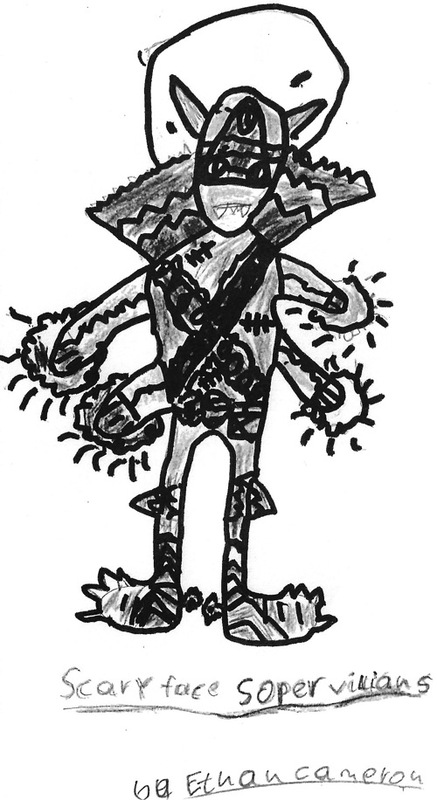 During subsequent visits, we worked with the class to design a cast of characters – two Viking brothers, a benevolent trader and a bloodthirsty berserker, and their father the warrior chief; a beautiful Scottish maiden and her father, also the chief of their village; a brave young boy; a cowardly village guard – and then had each pupil contribute an individual illustration that together would form a giant comic strip, showing Gerry’s story from start to finish. Visit the Every Picture Tells a Story site to see work from Ardeer Primary and all the schools taking part. With thanks to Fiona Firth and Mhairi Cook. 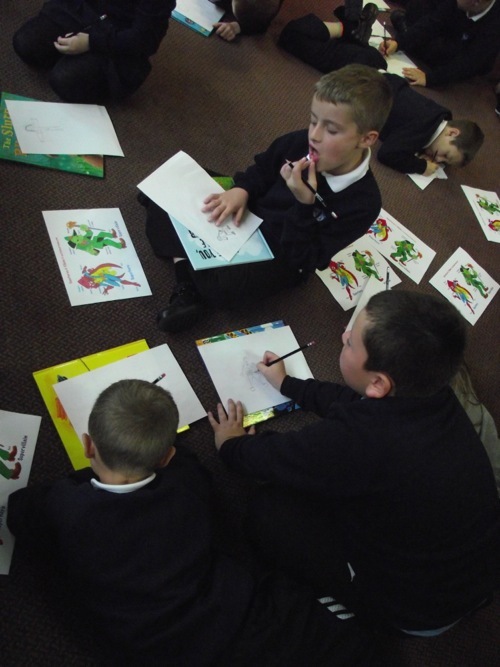 During Off the Page we visited Fallin Library and there worked with P4 from Fallin Primary to draw super heroes and villains. We talked about the differences between the two, what the details and colours of a costume can tell us about a character and how cartoon symbols can be used to express ideas. 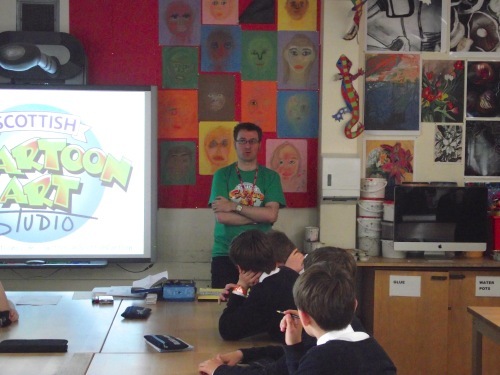 Later we spoke with S2 and S5 pupils at Queen Victoria School in Dunblane and looked at the “visual grammar” of comic book storytelling, how the design of a cartoon character can make it more sympathetic to a reader and contrasting European and Japanese approaches to comics/manga. You can see a letter from Fallin Library as well as some images from the workshop below. With thanks to Vivian Gibb and Chris Mitchell, a talented illustrator himself. If you would like to organize a workshop for children at your local school, library, community centre or club then we’re happy to discuss the possibilities. Please get in touch.